The CAN-bus IoT-Modem is an industrial version of the DPT-Board which can control a CAN-bus and a I2C bus. The module has all the power the DPT-Board offers but in an industrial grade version. Together with the range of CAN-bus modules large and reliable systems can be built. The IoT-modem comes with the DPT-Board operating system preinstalled. This system is derived from OpenWRT linux and completely open source. Next to the DPT-Board the IoT-modem also contains an ARM Cortex-M0 coprocessor to process real-time information. The hart of your industrial system has lot's of expansion interfaces. Off course there is the robuust CAN-bus port with built-in jumpers to terminate the bus, but there's also I2C, ethernet, WiFi and USB2.0 available. You can for example connect a 4G modem through ethernet or USB to be able to manage the IoT-modem even from remote locations. The AR9331 System-on-Chip from Atheros Qualcomm together with the STM32F0xx series microcontroller from ST Micro-electronics give the IoT-modem it's strenght. You can run complex GUI applications or process very fast CAN-bus protocols with ease. 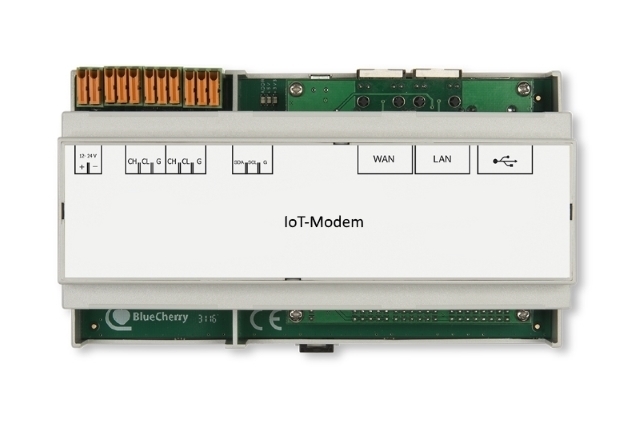 The IoT-modem is tested and CE certified for both home and industrial use. You can thus use it in industrial applications without having to worry about interference. The power supply voltage is between 12V and 24V, common for industrial use. The module comes in a standard DIN-rail housing. The housing can be stickered according to your specifications. There are many different therminal blocks possbile such as IDC, clamp and with screw.